Comment: Goodmorning Breakfast is a project from West Java, Indonesia being influenced by such acts like Oasis, and Suede by their own words. However, by listening to their 3-track issue it chirps even more interesting and reminding more of an epoch in the end of the 80s and in the beginning of the 90s where indie music did have many appearing forms while searching for more reliable manifestations. 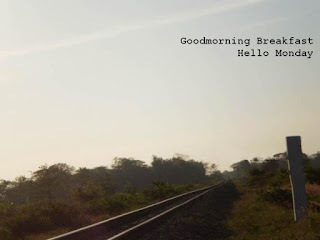 More profoundly, Goodmorning Breakfast`s Hello Monday chimes like a jangle act being organically imbued with psychedelic pop, northern soul and baggy/indie dance influences (in general, by post-punk influences). It reminds of an era after the C86 compilation when many light-hearted jangle acts changed into more dance-appealed and artsy ones (for instance, Soup Dragons, The Pastels, McCarthy). However, despite these parallels the artist is not a simulacrum to rehash the glorious past, it is worthy on its own. The issue is a part of StoneAge Records.